But return for a moment to the COLOURlovers investigation. Like good scientists, they don’t just present the data, but interpret it. Specifically they set out to compare how websites in similar categories branded themselves. On the face of it, you might expect companies offering similar services to brand themselves differently. 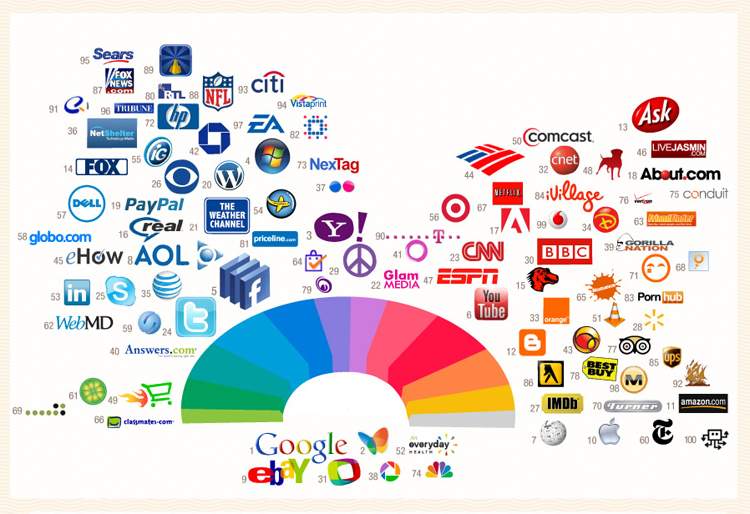 But the infographic suggests that in some categories, brands again cluster around certain colors. The trend is most observable in the social media category, where MySpace, Facebook, Twitter, and LinkedIn all have blue icons (which, after all, was the most popular color to begin with, but the let’s humor the folks at COLOURlovers for a moment; it may prove instructive). To return to the real estate analogy, this actually squares with the counterintuitive real estate choices of certain businesses. Why is there a diamond district, rather than having diamond dealers spread themselves across a city? In a phenomenon called “economies of agglomeration,” it turns out that attracting more customers to one region nets positively for most of the dealers involved. Perhaps a similar thing is going on with color; as the “blue district” becomes the only respectable place for a social media company to set up shop, a brilliant but fuchsia-branded networking site may flounder. What are the lessons to be learned here? If you want to launch a social media company to take on Facebook, your best bet is a classic cool shade of blue. But if you have a brand-new idea that’s a sure success and want to distinguish yourself–well, there seems to be a nice sliver of unclaimed space around lavender.